There are an endless number of opinions about when to start weaning your baby and what should you introduce when? When you start weaning is critical to your baby’s speech development among many other areas of development. The current school of thought is that when a baby is able to sit up and support themselves as well as supporting their head fully at about the age of 6 months, is the ideal time to start to introduce some form of solid food in supplement to milk feeds, whether breast or bottle. In addition small positive results from test foods, from the age of about 4 months on-wards, (by this I mean tip of the spoon tastes) can be swallowed easily without choking, then this is the right time to start. I agree with this age band for a number of reasons. By the age of 6 months a baby’s calorie demand increases and it may be difficult to feed them enough with just milk feeds to sustain appropriate growth for the coming months as well as the increase in mobility and activity that will follow when your baby starts to crawl and walk. Just sitting up and moving arms and legs in a controlled way and the additional demand on brain resources that this needs, indicates that a baby will need a higher calorie intake around this time. In addition it is at about 6 months of age that baby’s iron stores from birth start to deplete. Iron in breast milk is well absorbed but unfortunately it is in small quantities. Babies have surprisingly strong gums. The action of breast feeding encourages all of the muscle groups that are needed to support speech and also good dental development later on. Bottle fed babies do not use the same movements and as such can be prone to gagging if you delay introducing solid foods until much later on – say at a year old. The strong gums mean that baby can crush a fair variety of appropriately prepared solids, and finger foods but it goes without saying that they must be monitored carefully during eating for the foreseeable future. 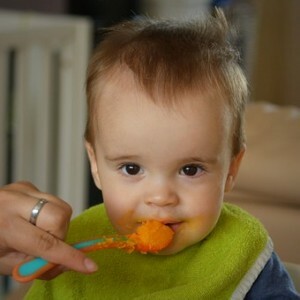 Weaning by introducing pureed foods and even a lidded cup can be started at 6 months because the action of sucking is not as much automatic at this age and starts to become voluntary and your child will have more control at this age. Between age 6-8 months your baby should be able to voluntarily open their mouth and wait for food, understanding the process of spoon to mouth and then learning to manipulate the food in the mouth until they cope with the texture. Use small mouthfuls carefully to begin with and then try finger foods which alongside small amounts of spoon feeding to encourage independence and choice and open the experience to more textures and flavours. By 10-12 months your baby should be able to cope with mashed foods. Even though they may use their tongue for support with a cup, they should be able to manage the action of chewing and sucking and swallowing. You can introduce a straw at this age as your little one will be able to understand how to such from a straw by now. From a year up to 15 months the bite reaction is more controlled and stronger and the child wants to use it! Depending on the presence of teeth, your child may bite down on the spoon and the jaw will get stronger every day that your baby is using it to consume food and drink. You may notice your baby biting the lid of the cup now much more frequently. Under 2 years old, your child may eat with their mouth open and food can spill out. This will change when they become a toddler and you can encourage appropriate closed mouth eating by example not by constantly correcting your toddler. After this age, there are more teeth and your toddler can cope with a wide variety of food, eating utensils and tools. 1. Introducing solid food and weaning is about the social and psychological aspects of enjoying food, eating within limits and not stuffing food or eating until the child is over full. Eating well starts from the first spoonful, and should be a time to encourage healthy options and low amounts of sweets and sugars that will cause dental problems and health issues later on. 2. Don’t bring anything into your home that you do not want your child to eat. This is a rule. You cannot say don’t eat this and you have it in your cupboard. 3. Good eating habits and introducing solid food at the right time is critical for healthy dental growth and speech development. If you are late introducing the first foods, your child may suffer from choking and gagging much more. In addition the muscles needed for speech and continuing development for eating are used even when your baby has no teeth and is chewing with their gums. Even the movement of the tongue side to side is essential for speech. 4. Don’t give up, just keep offering food regularly and don’t make a big deal out of refusals. If you are relaxed and laid back it will all go smoothly. Don’t delay altering the texture of food either. Staying on pureed food is not good for your child’s speech or their gut development. They need to learn to chew, swallow and digest food at the appropriate times. 5. If your child continues to refuse solid food for a period of time, talk to your doctor as your child may be suffering from another problem that is preventing them from eating appropriately such as tongue-tie etc. Make it a habit to eat healthily as a family. Although you will feed your child at different times of day in addition to family meal times, make sure they attend family meal times, so that they can watch you model good eating habits, the social aspects of mealtime and the confidence to try new foods comes from the family approach to eating much more than the variety of food you offer individually to your child.